Note: I wanted to use this website to post occasional pieces that carry more information and detail than there is space for in the confines of print. So, a version of this has appeared in the Telegraph but this is more than twice as long and includes pictures that didn’t. I’ve moved it off the home page because it’s longer than a quick coffee-break-read but tecchy limitations mean there can only be one Long Read here at once, so it will go back onto the blog once I need to make space for the next one. The Elqui Valley. I’d wanted to come to here for ages. On the southern edge of the Atacama Desert, the driest place on earth, Elqui is a narrow canyon that chisels into the Chilean Andes. It’s papaya and pisco country. Astronomers flock here to peer through 8-metre wide telescopes at the exceptionally clear skies. 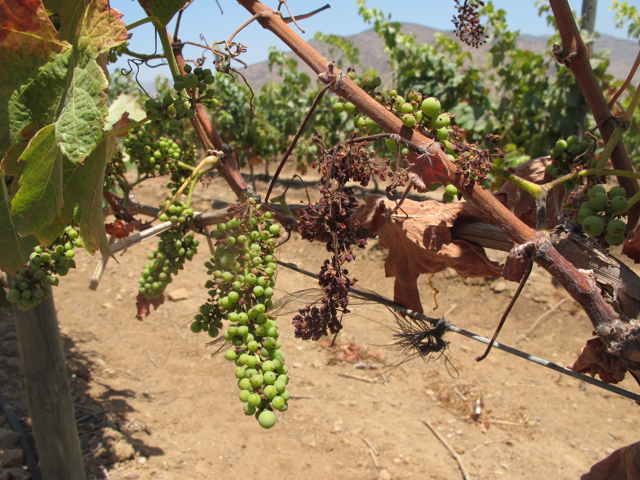 Against all the odds, they also grow wine grapes: Elqui is one of Chile’s newest and most northerly wine regions, defying the laws of heat and latitude with its proximity to the equator to produce so-called ‘cool climate’ syrah that has created quite a buzz in wine circles. Finally, I was here and an Italian called Giorgio Flessati was coming to pick me up in the seaside town of La Serena. 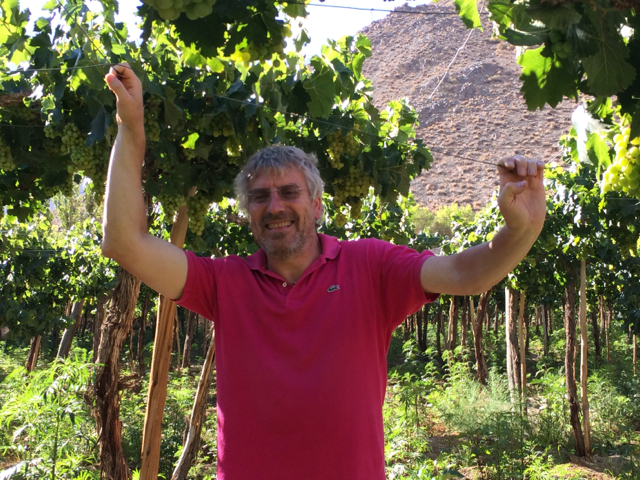 I knew Giorgio’s wines from supermarket tastings back home but was curious to see the land they came from and find out more about the other growers in Elqui. Would their wines have the same inky intensity and that very particular bitumen and black peppercorn bite? Giorgio was easy to spot; obviously European, resplendent in a fuchsia Lacoste collared t-shirt. It didn’t feel too sticky as we piled into his Mitsubishi L200 truck but I knew it would get hotter as we drove into the mountains and away from the coast, which is cooled by the breeze caused by a strong ocean current (the Humboldt) that drags icy water here from the Antarctic and is the reason that viticulture is possible here at all. I looked out of the car window. 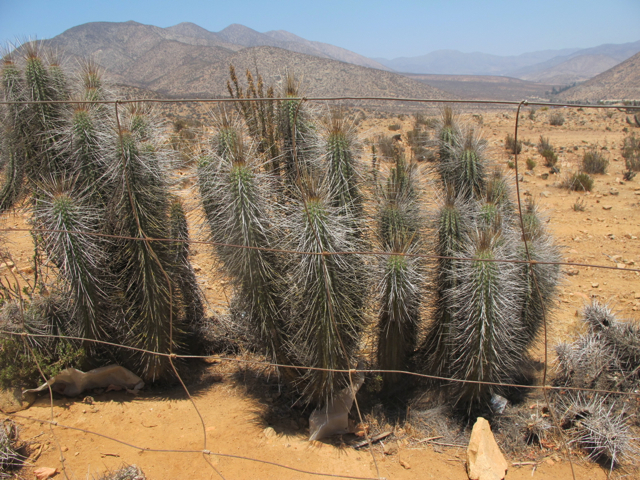 There were a lot of cacti in this cool climate. Not the first thing that makes me think, “Perfect for syrah.” There was no reason for it to be obvious to Giorgio either. True, he had done a winemaking stint in Australia’s Mclaren Vale but he had mostly worked in somewhat chillier Italy, most recently in Trentino, skiing country, where he had was general manager and winemaker of a big winery. This picture was taken from the vineyard, standing next to a row of vines and looking out across desert. The shadows on the ground were very high-contrast. The sunlight in Elqui is dazzling; the UV radiation so intense that it’s illegal not to supply outdoor workers with sunblock. It’s rained just twice here in the last 18 months. What sort of a person would try to make wine in what is essentially a desert? Was Giorgio a visionary? Or an energetic eccentric who’d got lucky? We spent the afternoon exploring the Flessati vineyards, most of them planted under Giorgio’s supervision. I’d imagined a few scraps of land, reclaimed here and there from the pisco grape growers or from the steep Andean slopes. Instead there was hectare after hectare after hectare. So many it was almost as if Giorgio had painted parts of the valley green. Giorgio, sheltering from the strong sun in one of his highest vineyards. The logistics of this part of the operation in particular seemed mind-boggling. We were in the middle of nowhere. 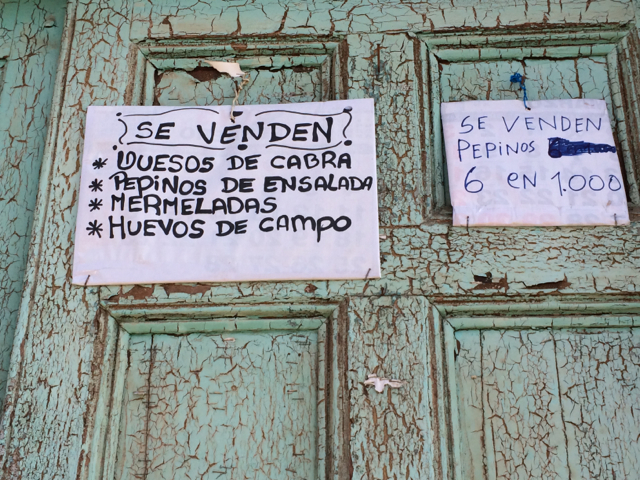 Even lower down, closer to the cooler coast, Giorgio said it cost an extra USD2 per case of wine in transport – of dry goods from Santiago up here and bottles of wine back. 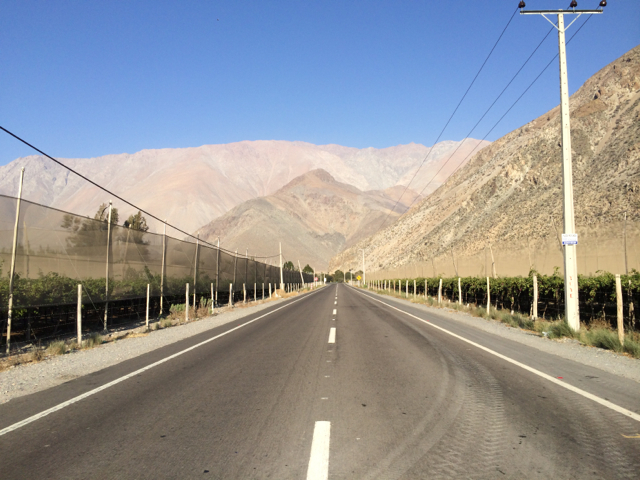 Pocket-plantations of huge red globe table grapes, and also grapes grown for pisco, at the side of the road as you ascend. Why had it not occurred to me before that if he was selling his wines in Asda, Majestic, Waitrose and Marks & Spencer as well as to restaurants then there must be really quite a lot of it? I checked the others out. 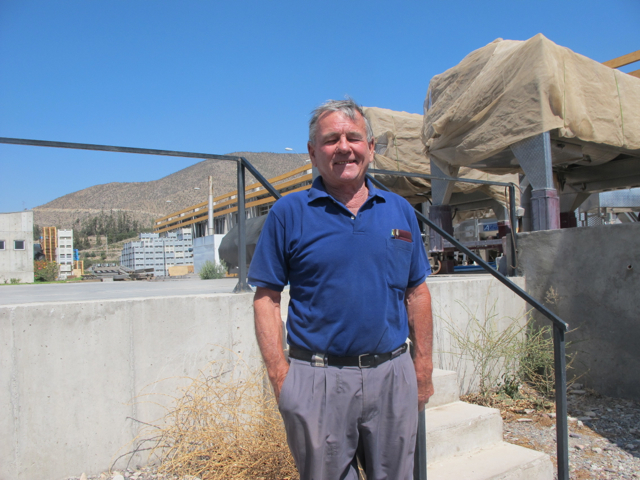 The huge Vina San Pedro told me they began buying grapes in Elqui only four years ago – relative newcomers compared to Giorgio. 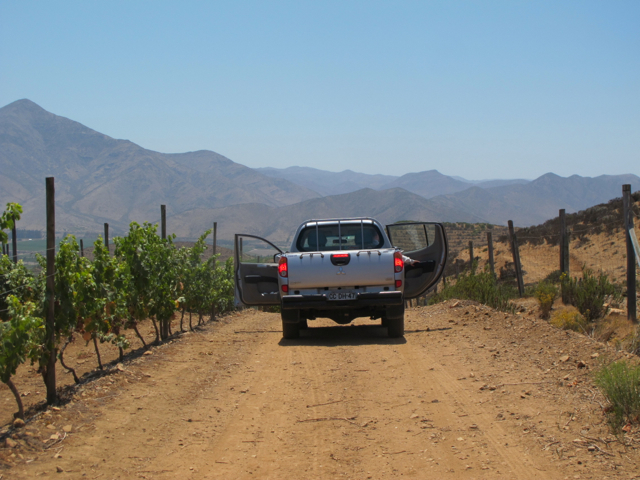 They now buy in grapes from around 100hectares of Elqui vineyards, mainly sauvignon blanc to go into their Castillo de Molina line and syrah for the 1865 range. They have also put in new plantations of their own and are experimenting with chardonnay and viognier but no, they don’t vinify in the valley. I also tasted an Elqui wine made by De Martino, one of Chile’s most exciting, forward-looking and high-quality producers. It was called De Martino Alto los Toros Single Vineyard Syrah 2011 (various vintages are stocked by Averys, Berry Bros & Rudd, The Wine Society, Les Caves de Pyrene, Virgin Wines). Made from syrah with 15% petit verdot, all grown in a place called Alcohuaz – the vineyards were planted in 2005 an astonishing 2,000m up in the Andes – it’s an incredible wine, very deep and rich and long. It reminded me of Oxo cubes and pink peppercorns and licorice. I loved it. But even so. The scale of what Giorgio was doing was vast, highly organized and incomparable. And it was quite a one-man show. We tried the wines. I wanted to like more of them more but the viognier was flat, the chardonnay tasted all wrong. There was an immense and immensely strange carmenere made using dried grapes in the style of amarone from north-east Italy, delicious in its way, idiosyncratic, but not my kind of thing. I only really liked the syrahs. But I did really like them. Also the dry PX was pretty good. 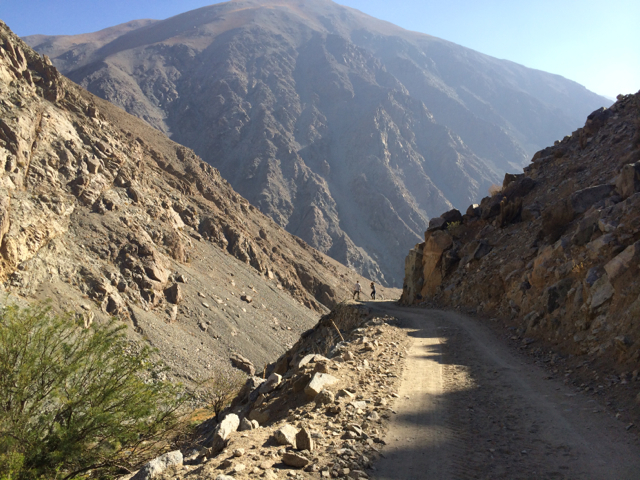 In some ways, I left Elqui none the wiser. Dust, sunset and cacti. 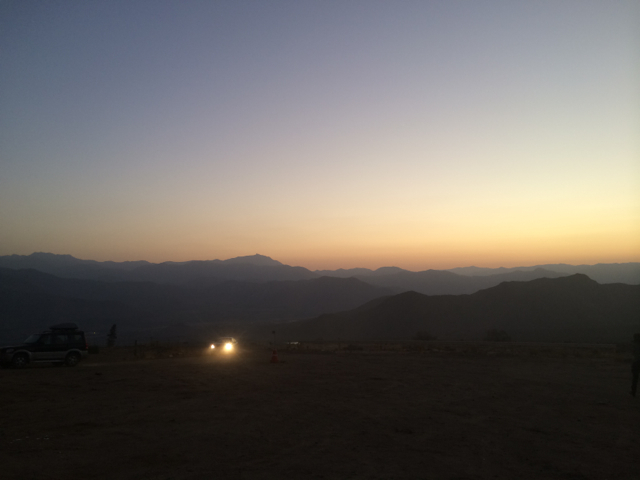 Cars arriving at the observatory for a night of star-gazing. Great article!!! You should have come by and tried my wines 🙂 All the very best from Chile! Nest time….great to hear from you. Thanks for getting in touch.